Welcome To 6714 Bansbridge Situated On A Quiet Family Oriented Crescent. This Lovely Well Maintained Semi Boasts 3 Bedrooms, 3 Washrooms, Eat-In Kitchen And Living Room That Walks Out To A Beautiful Deck. 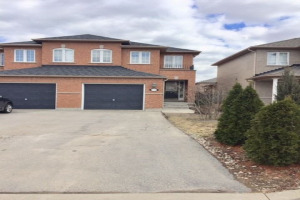 Close To Lisgar Go Station, Hwy 407, 401 & 403, Schools, Transportation, Parks & All Amenities. All Window Coverings, Elfs, Fridge, Stove, Washer & Dryer, Dishwasher & Garage Door Openers. Buyer And Buyer's Agent To Verify All Measurements, Taxes & Sold As Is.